No bear capable of living in the wild, other than those deemed dangerous to humans, has ever been brought to the WSU bear center. Common reasons for bears to be removed from the wild include being orphaned or habituated to humans. The captive bears at WSU are not viewed as a replacement for healthy, wild populations nor are studies on captive bears viewed as a replacement for studies of wild bears. 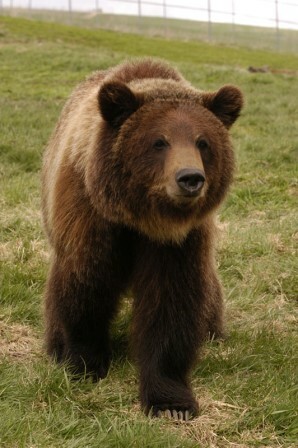 The captive bears are viewed as an important source of information or a means to develop new techniques that could then be applied to understanding the needs of wild bears. Anesthesia can produce changes in a number of physiological parameters in bears. Early in the program, Drs. Charles Robbins and Lynne Nelson recognized the need to work hands-on with unanesthetized bears to gather the most accurate data. That’s when they decided to train 4 grizzly bear cubs that could become a part of these physiologcal investigations. Luna and Mica were born in 2003 and Kio and Peeka were born in 2005 and required around-the-clock care for the first 3 months and bottle-feeding for the first 6 months. The huge investment payed off, as Luna, Mica, Kio, and Peeka have been instrumental in several groundbreaking studies in natural hibernation physiology. Because of that success, we bottle-raised and trained four more bears (Zuri, Dodge, Willow and Adak) during the winter of 2014-2015 for use in a wide range of studies. This population of tractable bears has revolutionized our research program. In order to facilitate ultrasonography of the bears’ hearts, Luna, Mica, Kio, and Peeka were trained to enter a metal crate and position themselves in a way that allowed researchers access to their chest with ultrasonography equipment. They have also been trained to lay down and present a hind foot to an awaiting researcher for blood collection. Bears at the Center can also open their mouths on command, paw or nose touch to different visual cues, and present their chest or flank for visual observation or palpation. In this way, we can minimize sedating bears for routine inspection. 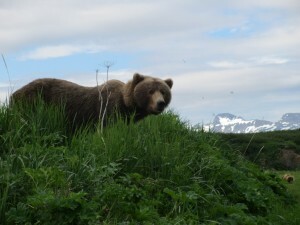 We found that, when motivated by honey, the bears are highly trainable, and virtually anything that could be done with other animals can be done with grizzly bears. The bears even appear to look forward to working. Training is ongoing, and we are optimistic that the bears will continue to learn many behaviors that may be helpful for future endeavors.